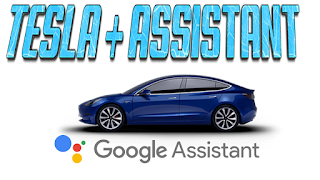 One of the things I did not touch upon much within my review of my Model 3 was Google Assistant, or rather the lack of it's existence. Tesla does a lot right but integrating with your phone while you drive is not one of them. Tesla uses it's own on screen software, which works really well. However without the ability to read text messages (probably the main feature I would love to see one day) it isn't as helpful as it could be. And then I thought, being able to ask your Google Assistant upcoming weather, or just random questions as you drive would be nice. I wanted a better integration of Google assistant while driving. The other aspect of Google assistant that I wanted to see integrate with my Tesla was while outside of the car. Sure the Tesla app allows you to access everything but what if I am getting ready in the morning and my phone is charging. I should be able to tell my Google Home to start warming my car. On a side note; since it is electric I can leave it in my garage and not worry about fumes. There is no such thing as a problem without a solution! The first aspect I wanted to have working was having access to Google Assistant while driving my car. You can download a demo of the app I used here. The way it works is each time you say "okay Google" and use your Google assistant, it appears on your car as a phone call. This allows you to hear and interact with Google Assistant while driving. You can watch a video of this in action below. The second part of the solution is being able to use Google Home. For the explanation of how to set this up and use it, it's best to watch the video below. The end result allows me to use my Google Home to issue commands to my car. Sure an integrated solution would be nice over using 3rd party solutions, however these work well enough for everyday use. Hopefully this helps.